In Shambhala Training III, we work in a deliberate way, making an effort to bring the mindfulness and awareness cultivated in our meditation practice into all aspects of daily life. When we become awake to our sense perceptions, we can venture into the world with confidence and vulnerability that is fearless, gentle, and alive. The warrior begins to expand awareness to explore the world with direct perception. This can be the beginning of a lifelong love affair with the phenomenal world, one not based on the reference points of hope and fear or gain and loss. Along this journey we develop genuine confidence, humor, and personal dignity. The Way of Shambhala includes Shambhala Training programs I–V, with each training followed by a five-week "In Everyday Life" course that expands upon what was offered in the training. Over the course of a year, these programs introduce the entire Shambhala path. This series offers a glimpse of the Shambhala vision of enlightened society by emphasizing how meditation can impact our daily lives—and from there, how the sanity of meditation can impact our community and our whole society. Joy in Everyday Life is recommended either before or after Shambhala Training III. 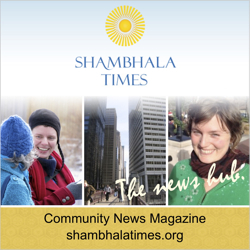 Please click here for a full description of the Way of Shambhala. If these pricing options are unworkable for you, we are happy to accept what you can offer, including volunteer service. Please contact Tracy Suchocki at [email protected] or call 303.444.0190 x104 at least three days in advance.